I was thinking that notion/sentence to bring up but ı was bussy and dont care much. But after saw this monstrous idiocy then ı just wanna write something about it. A4 (4th Raikage Unruly Ay) took on all 3 Sannin and come on top of 'em as the victor cuz he is faster ?!! One of the stupidiest ideas ı ever heard of in NBD and believe me ı read so many shits in this forum. And this is easily Top 5. Before debunking A4 as a kage and warrior. I wanna look at all this "speedster superiority" thing in all manga. 1st of all lets look at which is the most dominanat stat that the parrameters of the narutoverse cares more then others ? Lets look at some superior, dominant figures of Shinobi History. These are early legends of Shinobi History. Lets look at closer history. These are some of the most respected shinobies of different eras. And all of 'em officaly called as "Best of The Particular Era" . What is the most important and ovbious sentence that describes the success of the shinobi ? - Intelligence on action and in will power. Do you ever heard of some ninja that hailed as best of their era or most fearsome of their era or most deadliest of their era just with their speed ?! And definitely Sannin > A4+A3 in terms of portrayal & reputation. No one cares one dimensional speedsters. At least A3 covers his weakness points with his immense durability and strnegth also he is not hot headed and rushy as his son. But A4 is a complete disaster. Did he have versatility ? Nope. Didnt showed any projectile type attack he has no range at least A3 has Black Lightning (even w/o any feat with it.) Raikage did now anything about genjutsu, fujinjutsu, barrier jutsu, clone jutsu, summoning, This dude let his arm burn with Amaterasu cuz it aint a big deal for him. Cuz this dude didnt even used or gonna use a single hand seal/sign. There is no ninjutsu tooo. And he never performed high level taijutsu w/o his speed either. So all of he had immensive chakra reserves, top level physical attiributes (the most outshining of this attiributes is speed), inferior raiton armor. Did he hax any hax abilities ? His only " mere haxy" thing is his speed but he didnt accomplished anything big with his speed. He aint big at any stat of 4 major Stats in the verse. -> Challenge to FKS Sasuke -> Saved by Gaara from mutual death. And lost an arm in the process. he is too dimensional enough to force himselff thru enton shrouded ribcage susano. CUZ HE HAS ANY OTHER OPTION in terms of ninja skills. His only option was outlasting Sasuke but he was too damned UNRULY & DUMB for that. -> Didnt able to kill Jugo 2x attempt. -> Didnt able to crack Madara's ribcage susano or pierce Gaara's little amount of sand. -> He was the Grand General of the all army but didnt do nothing on strategy Shikaku runned all operation for him. Even Gaara was far far better commander. -> Didnt able to bring anything against Mini Shinsu Senju of Guruguru Yamato. Old-Age Hiruzen Edo was again portratyed as better than him in that scene. Even A3 has low-feats that proves that you cant accomplish anything with just speed. One of 12 clone of Naruto get in SM and own A3 with ease. Owned by 10000 fodder of a foreign nation (not an army from 5 big nation). If you think ım being unfair to him then listen to this. Hanzo cleared entire Konoha Division by himself abd spare the life of sannin. One Arm Jiraiya fought again 6PoP and took one of 'em down and able to escape. Same 6PoP demolished the strongest Village. WhiteMask Obito keep his place against Killer Bee + KCM2 Naruto + Gai + MS Kakashi w/o any worries. Sharing the same eye with Kakashi saved their asses. So what A3 did was not an exceptional thing for any mid to high kage level ninja. So A4 takin on 3 mid to high kage leveler just cuz of physical attiributes is a joke. Feats, reputations, portrayals and fundamental parameters of the series, ALL OF IT against that idiotic claim. And lets skip A4 and A3 , tryo to look at "speed" in general. Dİd Minato has reputation just cuz of his speed ? -> Nope he hailed as 1 time per century type Genius by Tsunade and Jiraiya and also described as sealing jutsu master and inventin new jutsus. So speed just one side of him. He is not just all about speed. Shizune was faster than Kabuto due to Kabuto's himself. What happened ? Genin Kiba was faster than Genin Naruto . What happened ? Kakashi was faster than Zabuza but this is didnt stopped Zabuza to take advantage from the location and locked up Kakashi ? Jiraiya faster than each Pain Path but he didnt overcome Sharing Vision ..
Killer Bee far faster than Kisame but still had huge trouble against him. Rock Lee was faster than Neji but still saw himself as inferior to him. Raikage was faster than Tsunade but Tsunade blocked Madara's downward katon attack before Raikage even flinced a bit. Tobirama was far faster than Kinkaku Force but he still used himself as bait/decoy and died. I can multiply these examples. In this series wielding some important skill was never been enough for being a big shot. BoS Naruto was wielding rasengan but didnt able to perform his War-Arc feats with his rasengan just cuz he was wielding it. Part 1 Oroc wileding the ET as a skill but this is didnt stopped Old Sarutobi to curse Oroc's all ninjutsu variants. Minato wielding senjutsu but cant accomplish what SM Naruto or SM Jiraiya can do with Senjutsu ! So just wielding some skill wasnt enough for this show. A4 wielding some immense raiton armor and that makes him really fast. But he is just wielding it. Aint has any mastery onto it. He aint has any sensory or precog skills So like Lee said to Sasuke "Your eyes can keep up with me but your body cant". And A4 has the exact opposite of this . His body can keep up but his mind cant. Thats why Tsunade outmaneuvered him against Madara. So A4 just wielding raw physicall attiributes and Raiton Armor to buff this attiributes but he is not creative, accurute and resourcefull with this. He is just wields. 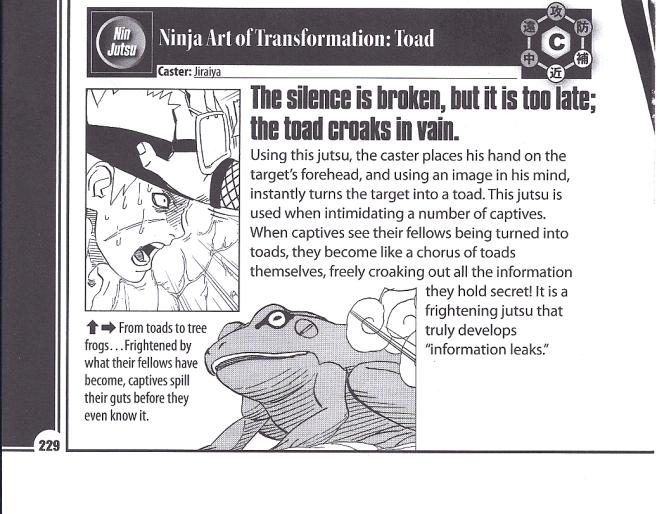 Thats why Obito was able to mock with him and make Raikage to toss in a wall cuz he cant control his speed like Minato or Naruto. 1st Speed is a critical factor in this series but just a factor not a main reason. And its important how to utilize it. Just wielding it and runnig thru on a linear way aint enough to be efficient with it. 2nd Just being fast never be enough and the results in the series proves this. 3rd A4 was a joke. Most useless speedster of all series. And probably worst kagehood career in all narutoverse (his only rival is Rasa) . And anyone who Thinks A4 could take all 3 sannin with mid diff or even A4 oneshots a mid-kage cuz of speed must consider to debate on any fictional work. Cuz they're not qualified. Seriously though, what can Jiraiya do to even scratch Bee? I'm genuinely clueless. 1st of all Jiraiya has 2 sealing jutsu that can disturb the link between Bee and Gyuuki and surprassing chakra.. Nothing just need to be about destructivity. 2nd Senpo Goemon's heat is over couple of thousands C degree (Hotter than Magma) And he can multiply the effect of Goemon if he uses Bunta as oil source instead of himself So even more devastating. 3rd SM Juiced Gamayu Endan and Yomi Numa still are solid options. Even heavily drugged and poisoned. ( Shizune was surprised even cuz of Jiraiya able to walk !) Yeah you might overlooked these jutsus but they're still solid. He aint has any open wound cuz of the attack. But he boiled cuz of the heat of it. Be cant tank this w/o some serious burns. Even Regular Cho Odama Rasengan described as "Mountain Carver" by databook. And even Naruto's imperfect Odama Rasengan created huge AoE. So Senjutsu juiced Cho Odama Rasengan aint something that Bee gonna tank w/o a problem. SM Jiraiya's SCOR on Preta Path, Naruto's Clones Base COR on Edo-Madara, SM Naruto's SCOR on Kyuubi. As you can see Jiraiya's jutsu almost big as Naruto's and the inner density of his version ever bigger and denser. So Bee cant shake this off easily. 5th Jiraiya has enough striking and lifting strength to hurt V6 Bee. His one simple kick flew Human path over dozens of meters away and bumped it on cement block and at first impact he losted his eyes instanly. Jiraiya also hurled a 100+ton caliber monster thru air while pushing through couple of meters thick cement wall and some big metal pipelines ! Even sick Orochimaru with overdue body (he wasnt able to move couple of minutes after this panel he was that sick and the temporary body was overused already) was able to hurt Kn4 Naruto which is stronger and more durable creature compare to V6 Bee. 6th Base Jiraiya's hair stong enough to demolish a hard shelled boss summon in a split-second and bend tough metal pipelines with ease (1). Also Fukasaku's tongue cutted Giant Chameleon like a butter and also cutted the bedrock floor. And Shima's tongue was fast enough to blitz Chameleon (and Animal Path's excpectations obviously) and whipped that to the rock floor and sprayed acid on it ! (2) And each Frog has paralyzing audio attack that stunned to giant Boss Summon in a split-second. Base Jiraiya already dealed with fiercer, stronger and more destructive semi-bijuu while he is holding off. SM Jiraiya w/ killing intent with his all arsenal.. Is something else. Akatsuki was a organization that builded cuz of hunting bijuus/jincs. Jiraiya dived into investigate of their very leader. And gain respect of his enemies. On the other hand who forced restricted Bee a mid-high diff admits there is huge level difference between J-Man and him. So both feats, portrayal and reputation is clear.. So saying things like "Jiraiya got nothing" just irrelevant per canon. I could go on later if you folks wanna see more. For now thats all.